The personal injury attorneys at Russell & Lazarus, APC can help both your loved one and your family recover damages if they’ve been injured in a nursing home. If you notice signs of elder abuse in nursing homes, call us to begin discussing your options today. 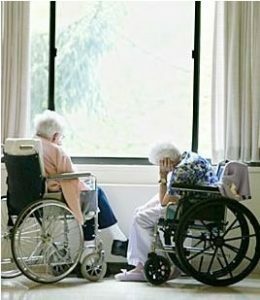 Nursing home abuse has become a major issue in the U.S. With the corporatization and the mass production of health care services has come a lower standard of care of one the most vulnerable segments of our population. Recent newspaper articles have discussed the corporate structures of these nursing homes that are ostensibly running at very modest profit margins but are paying exorbitant rental fees to parent companies that act like the most perfect kind of parasite. In fact, the parent companies insulate themselves from liability. They do so by owning each of the nursing homes in a shell company established for the purpose of protecting themselves from lawsuits. With this system in place, accountability only goes so far as the money that nursing home bring is immediately moved to the parent company. Needless to say, understaffing and under qualified staff has resulted in a number of patient injuries as the companies siphon much of the nursing facility’s operating budget. So if your loved one has sustained serious injuries due to a low standard of care, it isn’t surprising. There’s an increasing amount of complaints being levied at nursing homes. You are, however, entitled to sue the nursing home for damages. While much of their operating budget may be going to parent companies, complaints levied against nursing homes must be addressed. In cases where a judgment has been found against a nursing home, that debt must be paid to the injured party. Or, in cases where their abuse leads to death, the injured party’s estate. Lack of hygiene can increase the risk of infection or complications from recent surgeries or medical events. Again, the biggest problem in nursing homes is neglect from understaffing. Signs of malnutrition, such weight loss or dehydration, are clear signs that your loved one is not being cared for properly. Nursing staff are responsible for moving patients from the bath to their beds in order to bathe them. This often requires the use of a lift. Those who are not adequately trained run the risk of injuring patients and sometimes killing them. Sometimes the equipment is old or has not been maintenanced in a very long time. The nursing home is responsible for its employees and the equipment it uses. If nursing staff seems apprehensive about allowing you contact with your loved one, then you should be immediately suspicious. They sometimes illegally use restraints on dementia patients and these patients suffer serious injuries while they’re restrained. Insist that you be allowed to see your loved ones if this becomes a continuing problem. If your loved one becomes visibly uncomfortable around nursing staff or shows fear when you’re about to leave, that may be an indication that the nursing staff is abusing them. If your loved one suddenly contracts an STD or is being treated for an STD that seems unlikely, then this could be a sign of sexual abuse. Sad as it is to say, this does nonetheless happen in nursing homes. your loved one’s room appears untidy. If you see signs of abuse, say something. Contact the authorities. Then find a elder abuse attorney who can help. The attorneys at Russell & Lazarus APC do not appreciate seeing the most vulnerable members of our society being systematically abused by for-profit nursing homes. If your loved one has shown signs of abuse, contact us as soon as possible. We can help you fight for your loved one’s rights.